The second half of the twentieth century witnessed a quite dramatic shift in the nature of white-collar employment, from lifetime tenure, often in a very hierarchical work structure, to a new model defined by flatter organizations, job insecurity, shorter tenures, declining attachment between employer and employee, and contingent work. Managing employment relations has become an issue of huge strategic importance as businesses struggle to respond to the pace of change in management systems and working practices. 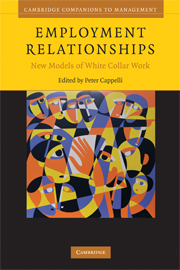 Employment Relationships: New Models of White-Collar Work traces the latest developments in employment arrangements drawn from a number of business contexts. These include the rising role of outside hiring and lateral moves in shaping and managing careers, increased career uncertainty, and much greater variety in organizational structures – even within industries and professions – as employers struggle to meet the diverging demands of their product markets. Employment Relationships offers an authoritative resource for students and scholars wanting to understand the role of employment relations in real-world business settings. Cambridge Companions to Management is an essential new resource for academics, graduate students, and reflective business practitioners seeking cutting-edge perspectives on managing people in organizations. Each Companion integrates the latest academic thinking with contemporary business practice, dealing with real-world issues facing organizations and individuals in the workplace, and demonstrating how and why practice has changed over time. World-class editors and contributors write with unrivaled depth on managing people and organizations in today’s global business environment, making the series a truly international resource. Matthew Bidwell is Assistant Professor of Strategy and Management at INSEAD. Forrest Briscoe is Assistant Professor of Labor and Employment Studies and Sociology at Pennsylvania State University. John C. Dencker is Assistant Professor at the Institute of Labor and Industrial Relations, University of Illinois at Urbana-Champaign. Isabel Fernandez-Mateo is Assistant Professor of Strategic and International Management at the London Business School. Peter D. Sherer is Associate Professor of Human Resources and Organizational Dynamics at the Haskayne School of Business, University of Calgary. Steffanie L. Wilk is Associate Professor of Management and Human Resources at the Fisher College of Business, Ohio State University. Margaret Yap is Assistant Professor in the School of Business Management, Ryerson University, Toronto.